This is one of my favorite PS4 concepts. I hope Sony really takes the design to the next level. I have to say, while I don't mind the concept drawing of the system itself, that controller design looks terrible. It's way too wide where your hands would be holding it, which would make using the analog sticks a chore. but in white i like the system it self is really good. i hope sony chooses something similar to that design(except for the controller) because it is really good, and I dont want a peice of sheite made of glass with a ball in the middle like everyone says its gonna be. i love the ps4 is looks clean but not so much to the controller that would be a problem for me. people mite not by to ps4 because it is a lot and some people just mite buy it but they mite have to pay of there mom and dad by doing chores around the house and they wont be able to play it as much an get mad and take it back and than no mare play station 4. DONT MAKE A NEW PLAYSTATION! then you have to buy all new games and ti relly expensive please DONT MAKE A NEW ONE PLEASE! I not an XBOX fan please dont make a 720 XBOX PLEASE! i really like this concept drawing its sleek design looks marvalous. i like the controllers just think they need sum tweaking a bit!! i really like the design its sleek and futuristic. the controller is nice but it would be better if it was closer to the ps3 style that everyone is use to. Wow i love the design the please Sony sort out the Controller it's too wide for my liking and can some please tell me when PS4 is coming out? 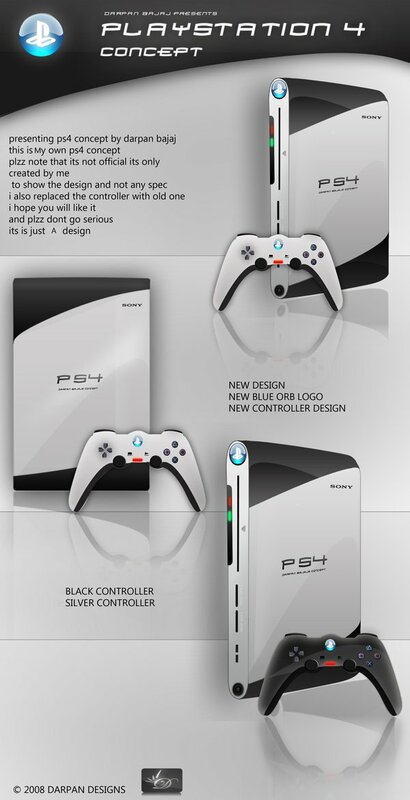 I love this ps4 concept lets hope it becomes a reallity. Sony release the ps4 soon!! we are all ready next gen graphics and game play.While i wait for the release date to roll around i'll save up a few bucks. I doubt they want to make the new one even uglier than the previous one. I think that the design is very interesting...gamers are seeing something totally different from the previous prototypes but the controller would have been better if it was either a cousin to the ps3 one or an amelioration to it .I don't think that going back into the past is a good idea but overall ,this is a great design,I would totally buy the console if this design was chosen . remote is really bad they should have something similar to dual shock 3 or vita and not have that crazy grip. also the color seems odd as sony kind of is the matte black crew and albino seems weird.